All summer I saw photographs on the internet, as I’m sure you did - of people telling horror stories about ‘Moya Ulitsa’ / ‘My Street’ - a Moscow City project to improve the cityscape. 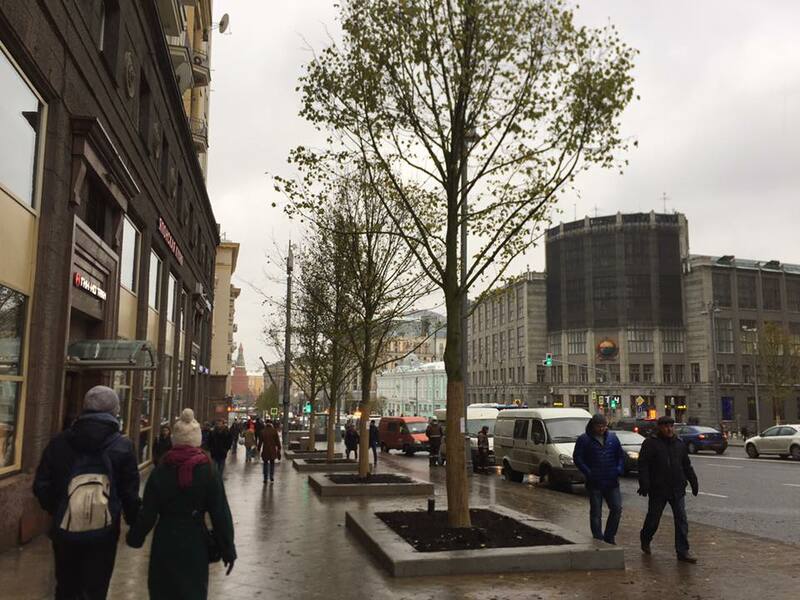 Until last month, Moscow was at a standstill as streets were closed to allow reconstruction including pavement widening, new paving stones, lampposts, traffic lights and planters. The results are radical - dramatically altering the experience of being in Moscow. On the one hand it is an incredible achievement, allowing the architecture of the city to breathe again, and to be enjoyed by pedestrians – on the other, it reveals Moscow to be a primarily Stalinist-era city, a fact that had been hitherto softened by urban chaos. Within Moscow, opinions are divided, partly because the city lost the love of its citizens over the course of several months of hot and sticky traffic jams due to the street work. To a Londoner’s eye, it is incredible and a little frightening to witness the results of these centralised decisions. Where is the chaotic, organic, ecology of the city? Where is the teeming street life – the expressions of commerce: adverts, neon, kiosks? How is it possible to simply make them disappear? A whopping 1.4% of the city’s total annual budget was used to pay for the work, evident in the high quality of stone used for paving. It is said that all the quarries of Russia were emptied by the work, causing delays. This kind of fact harks back to the time of Peter the Great, who exhausted ready supplies of stone in Russia while building St Petersburg. A friend drove me from the airport and decided to show me the centre. I’d been away for two years - my eyes were on stalks. 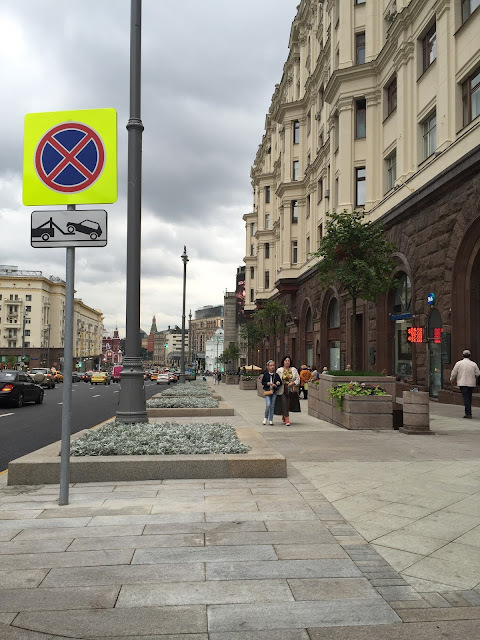 The pavements of Tverskaya Street had been widened - but more extraordinarily there was a set of arches at every main axis, that had been lifted straight from a Stalin-era book on architectural design. They were cheerfully painted like something from a 1940s fairground, framing whatever happened to be behind them - Pushkin, Tverskoi Boulevard, the entrance to Red Square, and most absurdly, Karl Marx. 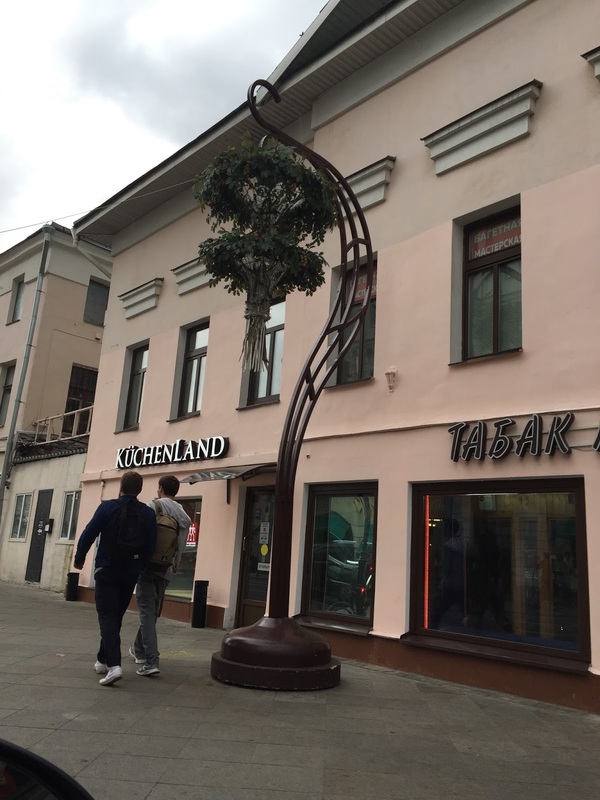 Maroseika and Pokrovka were dotted with peculiar iron poles, curved into long ’S’s and topped with hanging baskets like wreaths that light up at night. Why? What were these for? Why clear the city of kiosks and widen the pavements, only to replace them with decorations? The Novy Arbat was crowded with benches 20 metres long, and there were swings too – on Triumfalnaya Square, designed for adults and children. 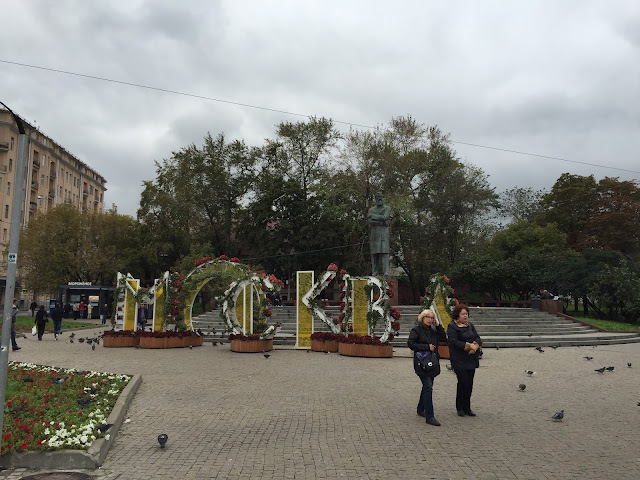 In addition there were letters spelling out MOSCOW. 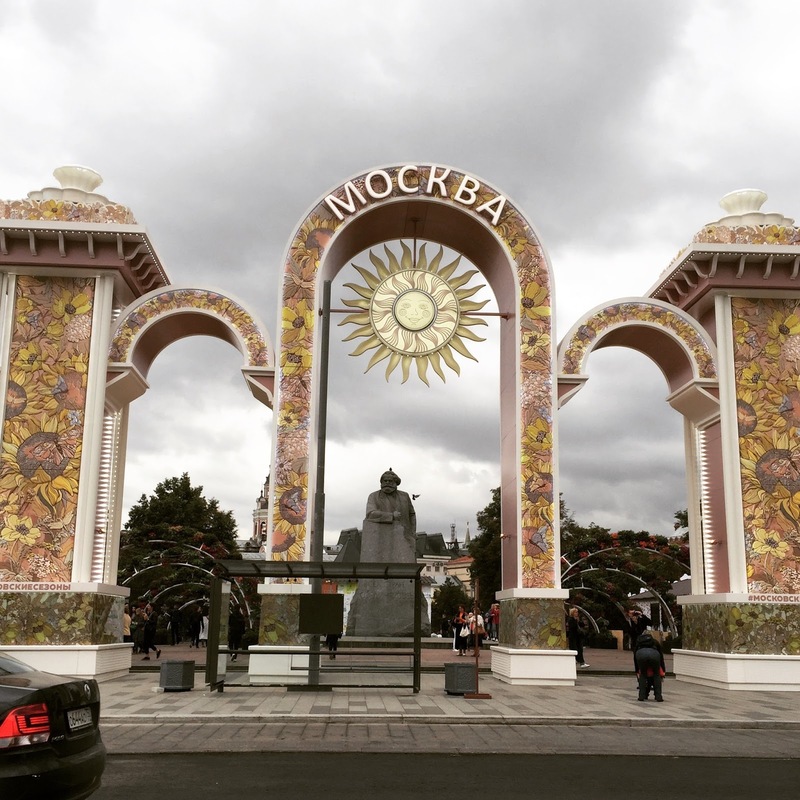 These additions were added by the City government after the main street work was completed – a nostalgic throwback to Soviet and pre Soviet street decorations and an irresistible urge for Moscow to proclaim its own greatness. 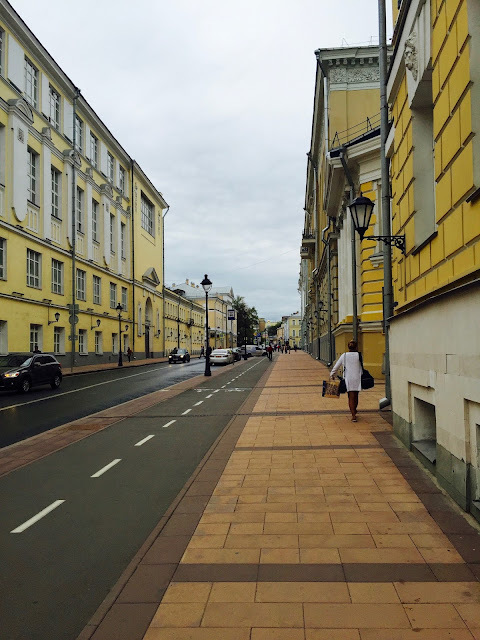 Most striking are the new vistas: Moscow’s main streets and main dominants were constructed in neo-classical style in the Stalin era. 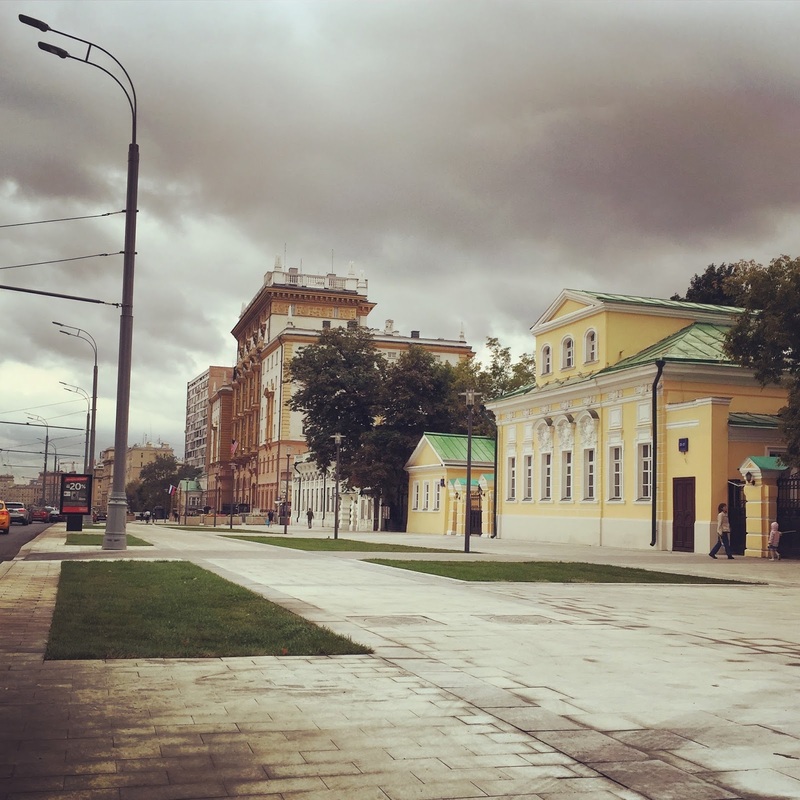 Until now, it was possible to balance that out in one’s mind with other, older streets, for example the area that escaped mostly unscathed around Ostozhenka and Prechistenka. This balance is now tipped towards the imposing grandiosity of the majority of the main streets, that are Stalin-era. For the first time, I left Moscow disliking this architectural period. The buildings were designed to impose, to intimidate; the ‘seven sisters’ were intended to make the average soviet citizen feel small: this was softened and leavened by the human chaos at street level. That has now been removed. Much of the centre of Moscow now looks like an architects’ drawing: restrained and containing a vision of an ideal, orderly world. Town planning decisions of this kind can only be made in a centralised power structure like Russia’s. On the other hand, the buildings on the re-profiled streets look magnificent. The pavements are broader and it is more pleasant for pedestrians. I am aware that I was seeing it before the trees were introduced: now 30 year old trees are being planted all around the Garden Ring, bringing it in line with its name once more (it was widened under Stalin and the trees were cut down). This will soften the formalising effects of Moya Ulitsa. A trip on the metro revealed that all the advertising had been removed. A well-coordinated graphic design campaign has led to an elegant reconfiguration of the Moscow metro map by Artemy Lebedev’s studio and other graphics including long lists of rules/Правила использования. ‘Навели порядок’ – ‘Order has been imposed’ – is what I kept thinking to myself. This is a mantra for Russia today, with its increased militarisation. 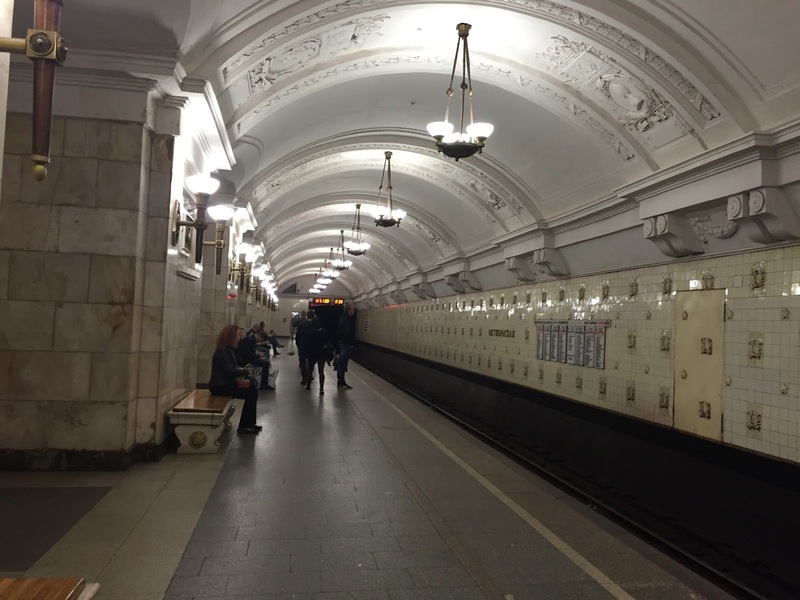 There is a feeling that more aspects of people’s lives are being controlled and manipulated: in Moscow today this is embodied in the newly designed cityscape, and in the metros, cleared of adverts but full of rules. ‘Moya ulitsa’ has democratic roots and aspirations: it was conceived as a civic project in which ordinary citizens could take part by expressing their wishes for Moscow, their likes and dislikes. The emphasis has switched away from the car-user to the pedestrian, cyclist and scooter-user, now supplied with bicycle lanes on many central thoroughfares. One of the reasons that pavements have been widened is to reduce road space for cars in order to solve the city’s chronic traffic problems by discouraging people from driving. This is a radical decision that few cities dare to make, in thrall as they are to road users. 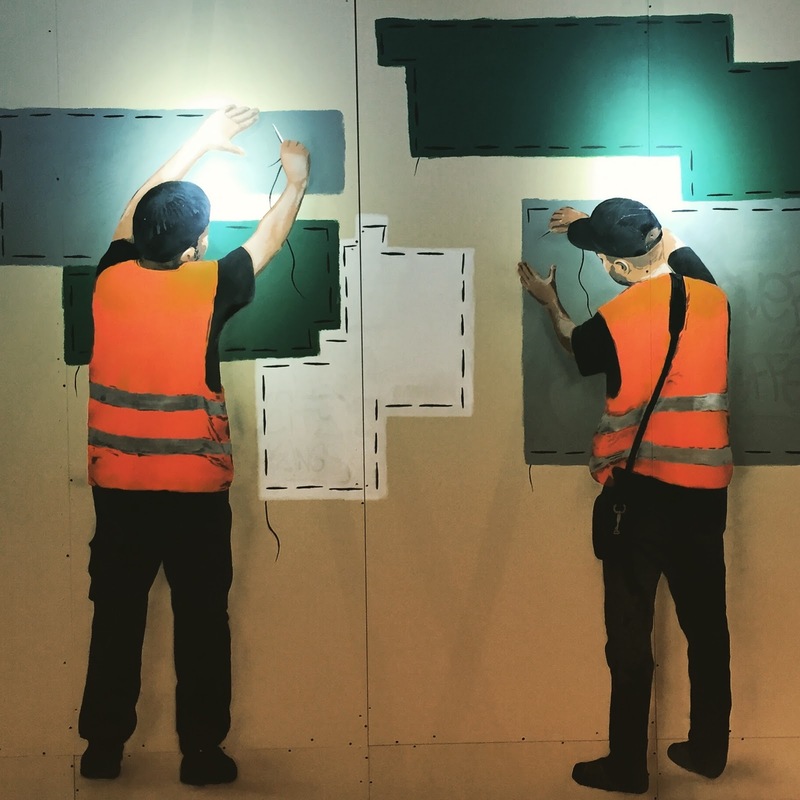 There was a street-art biennale in the Manezh during my visit to Moscow that also reflected the current trend. The untrammelled spirit of illegal street art had been contained and sanitised by being removed from the street. The work, although much of it visually arresting, had lost its power out of context. In short, while impressed by these changes to Moscow, I’m not so keen on the Moscow that it has revealed. Was I living in a fantasy before? I think not - it could be argued that this controlled cityscape is more of a fantasy city than ever but one of little joy, despite the gaudy arches and street swings. And all the lights at night, Clem! 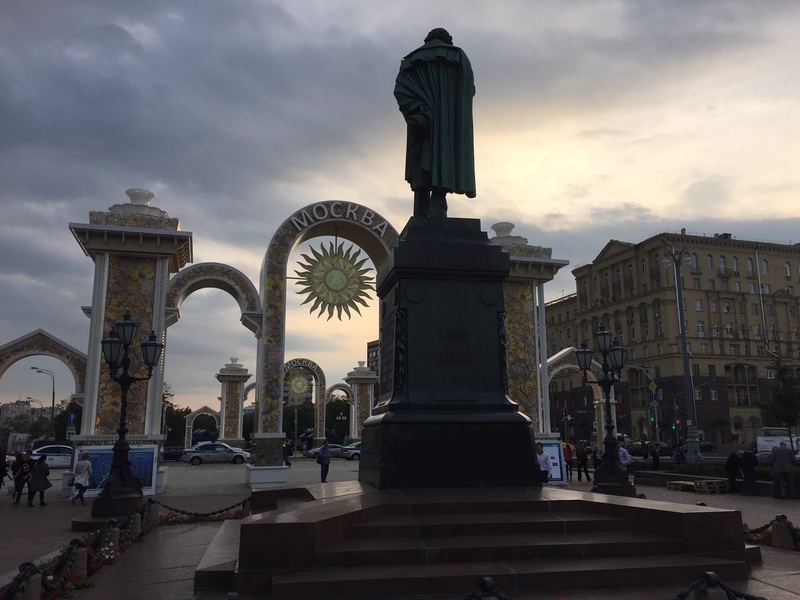 I was amazed at the waste of electricity - all night the planters and the weird fake flower arrangements on Kuznetsky Most are lit up, unnecessarily! An elegant reflection on a bold piece of civic design. On the face of it, reclaiming street space for people on foot rather than caged in vehicles seems rooted in an essentially democratic spirit. Perhaps over time these safer, cleaner and greener spaces will repopulate with the street life you miss?